A few years ago as our family was visiting Santa Claus, Indiana and we popped into Santa's Candy Castle, a cute little candy shop just down the road from Holiday World where toys were once made. Today it houses a variety of different sweets, gourmet popcorn, fudge, books, ornaments and holiday items. You can also sit down at a computer to talk to an elf. So, on our visit we met the owner, Kevin, who told us we had to try their specialty drink, the frozen hot chocolate. He brought out a sample and I was hooked instantly. I drink hot chocolate year round. Since I'm not a coffee drinker and I sometimes like something hot in the morning or before bed, I'll make a cup of hot chocolate. This is even better - it's the perfect treat to cool you down on a hot day. That visit lasted three days. All three days I was there getting a frozen hot chocolate. When we made our next trip to Santa Claus, the first place we stopped was Santa's Candy Castle. Then on our last day of our trip after horseback riding at Santa's Stables, we stopped in for frozen hot chocolate. Since they were $4.50 each and a 1/2 gallon size was $16, I thought I'd save the couple of buck and see if the kids could finish one off. 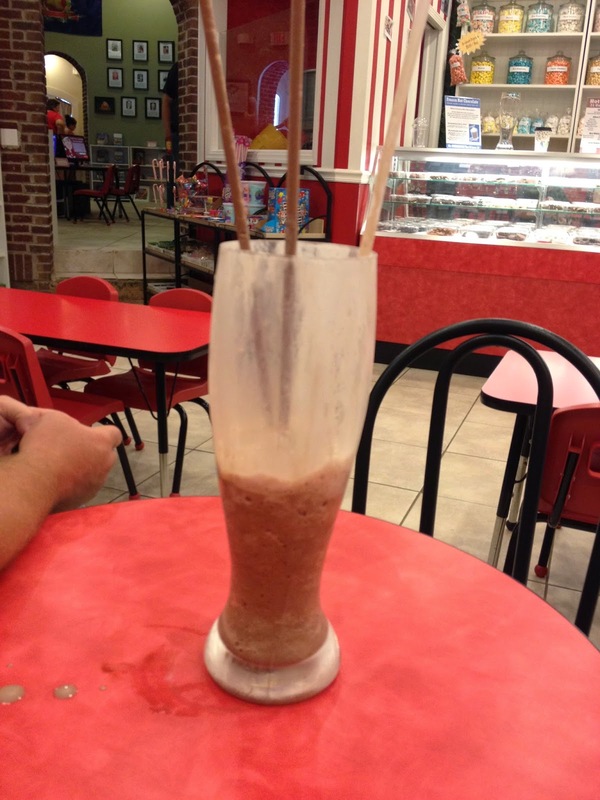 So, this is what 64 ounces of frozen hot chocolate looks like - along with super sized straws. And then it was emptied. If you happen to be able to finish one off all by your self, you'll even earn a spot on the wall. There's also a food challenge of drinking one of those along with a bowl of super spicy popcorn. On our last visit, we happen to walk in as Jeremiah Forster was in the middle of that challenge. We got to see him break the record. :) Can't believe that skinny guy finished it off. Turned out he's a competitive eater who travels around for many of these challenges. 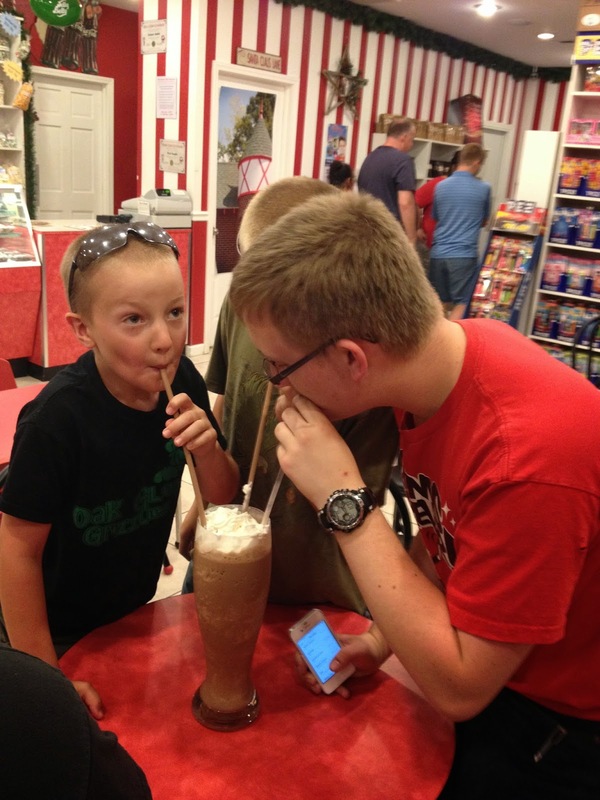 We revisited for the Halloween weekends this year and the first place I had to stop was for a frozen hot chocolate. I've yet to find anything even close to it in the Chicago area. I attempted to order one at Starbucks one time and they looked at me like I was crazy when I tried to describe it. 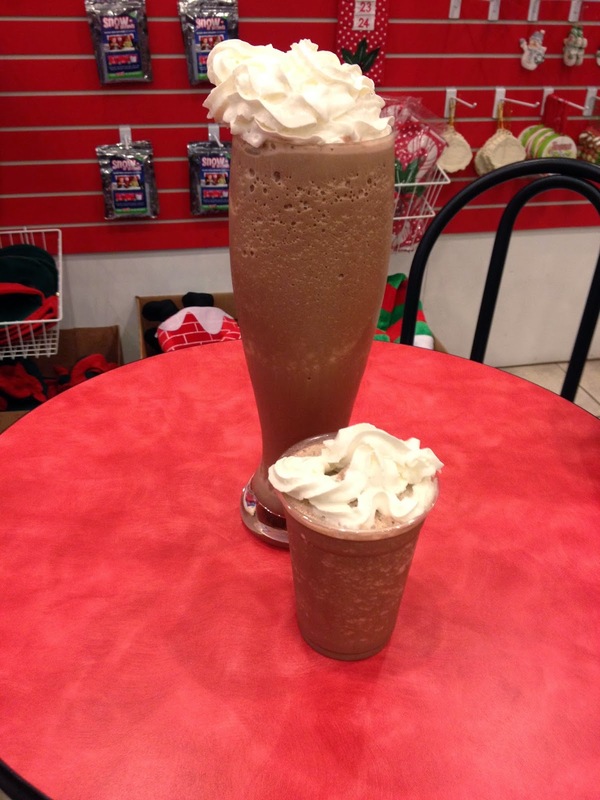 Right now the only place to get this delicious beverage is a trip to Santa Claus. It's one of the many things that makes a road trip to the little southern Indiana town worth the drive.